When it comes to the evolving world of influencers, how can you measure the success of your campaign? We look at three common metrics including Reach, Engagement and Timeline Deliveries. Reach is the amount of people that have seen an influencers content, with bespoke hashtags often used to accurately measure the reach of a social influencer campaign. Brands can be tempted to work with influencers who have a large audience, and therefore a high audience reach, however this can generate disappointing results if they are not carefully chosen based on their niche and audience. For example, an influencer might have 1 million followers and therefore a potentially high reach, but if only 2% of their followers is the correct target audience then it is unlikely that the audience will engage with the content. Instead, it could be more beneficial to work with numerous smaller influencers who have the perfect target audience and the same accumulated reach of one big influencer. Influencer outreach is all about finding that perfect platform for promoting your product or service in a way which will resonate with their audience. Influencers should be carefully sourced based on a brand’s specifications to deliver the best results. Timeline deliveries are a measure of how many times influencer content has been viewed. For example, an influencer at a screening event would be encouraged to produce multiple pieces of content throughout the night, sharing their experience with their viewers, and therefore generating more timeline deliveries than if they posted only once. Additional pieces of coverage on an influencer's platform can be fantastic for ensuring that the content is viewed as many times as possible, perfect for increasing brand awareness. 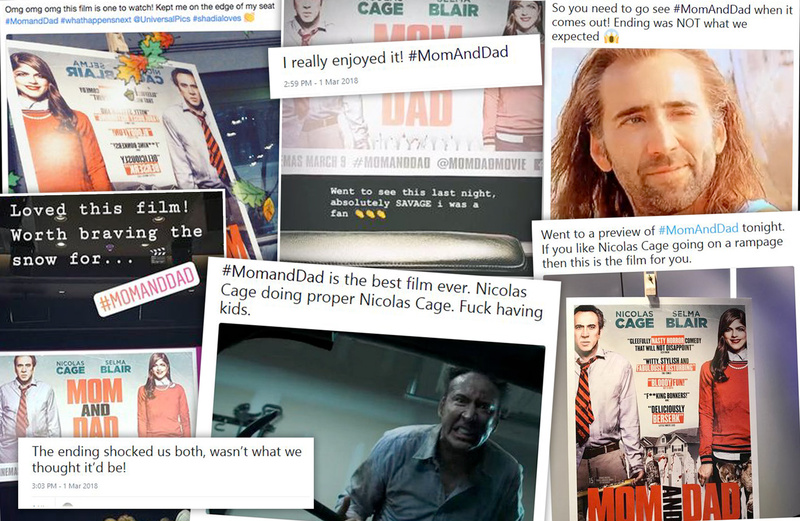 Tasked with getting influencers excited about the release of Mom and Dad, we provided a special screening experience, exclusive content and key assets to generate a completely organic campaign with positive sentiment across all social platforms. We also worked with key film and lifestyle influencers to promote the film on their social media platforms. Results / Stats: A fantastic result with the attendance and social support of leading film and entertainment influencers, who had an accumulated following of 1.1 Million including names such as Mark Ferris (579k Followers). Overall the campaign generated 3.4 Million impressions on Instagram. Another metric which is highly valuable for measuring success is engagement, where an audience has actively taken an action as a result of content they have viewed. Engagement on social media platforms can take the form of likes, comments and shares. CPE (cost per engagement) can be calculated as a metric for measuring the success of a campaign. For our Scalextric Christmas campaign, we worked with Dad influencer LadBaby (1 Million Followers) famous for his ‘Dad hacks’ to create a fun video concept positioning the Scalextric as the perfect Christmas present that both Dad and son could enjoy together. The overall CPE for this video content was a fantastic £0.02. Results: The video went viral on Facebook with over 6.4 Million views and was also featured by Ladbible to their 28 Million Followers. These metrics are helpful for measuring the success of your campaign, however first and foremost a successful campaign should produce quality content which resonates with your target audience. Our influencers are carefully sourced depending upon a brand's specifications, as well as managed from the concept of the content all the way to content going live on their platforms. We also work closely with the influencers to establish coverage which will produce the best results for the brands, increasing brand awareness, reach and engagement as much as possible. To hear about all our current opportunities straight to your inbox, please sign up here.